The announcement marks the international consolidation of UNIR as a member of one of the most important institutions on e-learning Worldwide. Fabio Nascimbeni, researcher belonging to the Telsock Research Group (UNIR Research; http://research.unir.net), highlighted the relevance of that milestone for the institution. 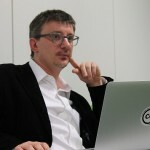 Director of the MENON Network, researcher belonging to the UNIR Research Group TELSOCK (Technology-enhanced Learning & Social Networks), Fabio Nascimbeni has been renewed as executive member of EDEN (European Distance and E-Learning Network). It represents a recognition of his labour coordinating research and innovative projects on the ICT for learning field (Helios, Learnovation, or VISIR). We´ve talked with Fabio Nascimbeni about this milestone, in the following interview. UNIR Research: What represents exactly to be one of the members of EDEN? UNIR Research: What are the principal advantages for UNIR of this announcement? Fabio Nascimbeni: I will be representing the Universidad Internacional de la Rioja (UNIR) in the EDEN executive board. I think it will be important for UNIR to be represented there, mainly to make sure that what UNIR is doing can be channeled to through the EDEN network: I hope, through my position in EDEN, to make sure that important outcomes and ideas coming from UNIR enter in the information flow. UNIR Research: Did this information may contain key clues for e-learning, which is the main core for UNIR? Fabio Nascimbeni: Yes, especially at the policy level. Because EDEN is also working with the European Commission to facilitate policy development in the field of opening distance learning and to promote what is happening among the EDEN members in terms of projects and events. I would say that, with respect to the many connections that UNIR has in place, EDEN will improve the European networking dimension among the EDEN members which are universities, schools, companies, civil society organizations, students, organizations, and other stakeholders. Fabio Nascimbeni: Of course, EDEN is itself running some European funding projects that UNIR could join or could help to develop. So, I think is a good development that UNIR can be better represented in EDEN through the Management Board. UNIR Research: What about UNIR researchers, how can they make the most of this collaboration? Fabio Nascimbeni: Today, everything you do, you can´t do it alone. We´ve seen that UNIR is doing many innovative projects and of course the idea is to enlarge the possibility of getting new inputs, and increasing the outcome and impact of what UNIR is doing. Networks like EDEN offer this opportunity, and I think that the more active a member of these networks is, the more it can increase the visibility of researchers from UNIR who can present their works in the EDEN conferences, EDEN research workshop, and online discussion, getting peers comments and ultimately improving our work through collaboration.